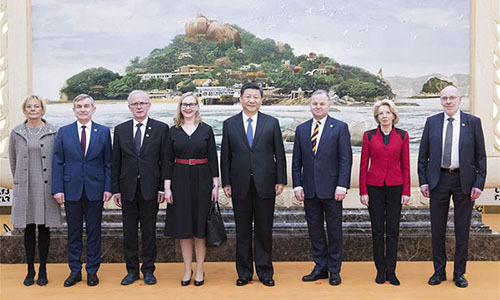 Chinese President Xi Jinping met in Beijing on Wednesday with parliamentary leaders of Nordic and Baltic countries, hoping for more high-level exchanges and deeper cooperation. The delegates include Finland's Speaker of Parliament Maria Lohela, Norway's Olemic Thommessen, Iceland's Steingrimur J. Sigfusson, Estonia's Eiki Nestor, Latvia's Inara Murniece, Lithuania's Viktoras Pranckietis and Sweden's deputy speaker Eva Thalen Finne. During the meeting, Xi said the visit is a new form of collective high-level exchanges between China and the Nordic and Baltic countries. The visit marks a new era for relations between the two sides, featuring increased political mutual trust and rapid development of exchanges and cooperation, he said. "To develop a healthy, stable and sustainable relationship and to promote mutually beneficial cooperation at bilateral and regional level are not only in the interests of our respective countries but also conducive to pushing forward the development of the comprehensive strategic partnership between China and the EU," said Xi. Both sides should always adhere to mutual respect, equality and inclusiveness, respect each other's core interests and major concerns, and push forward bilateral relations along the right track, he said. He suggested the two sides enhance pragmatic cooperation within the framework of the Belt and Road initiative, so as to share the benefit brought by the interconnection of Asia and Europe. Xi also briefed the guests with China's economic and social development as well as its foreign policy of peace. He said China will promote the building of a new type of international relations and a community with shared future for mankind, which are not only the goals of China's diplomacy in the new era but the direction in which all countries should work. China will continue to actively participate in reform and construction of global governance and promote development of a global governance system that is more just and reasonable, said Xi. The guests congratulated on the success of the 19th National Congress of the Communist Party of China (CPC), and praised the people-centered goals put forward by the congress. They agreed that China's achievements in economic development, improvement of people's livelihood, poverty alleviation and environmental protection are historic. They said the Nordic and Baltic countries value the friendship with China and are ready to further their cooperation with the country.